This is a milestone week, and I’m feeling sentimental. On September 6, 1987 I hosted my first radio program! 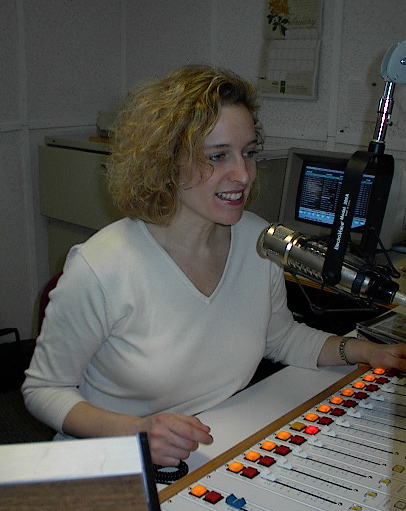 It was a local show on WSHU Public Radio in my hometown of Fairfield, Connecticut and the manager there entrusted me with the responsibility and privilege of being a radio announcer despite my complete lack of experience. Armed with my newly minted degree in music, I had never even set foot in a radio station before that week, and it was truly seat-of-the-pants learning. “Sunday Morning Baroque” was born on that day. It was a 90 minute “filler” program between two network shows, airing from 8:30-10am, and the only instructions given were to “play baroque music.” When I opened that microphone for the first time, it was terrifying and thrilling. If only there were a tape of those first few shows! It changed my life. Listeners like you responded enthusiastically, and Sunday Morning Baroque lived and grew and expanded on WSHU. On September 6, 1998 — eleven years to the day later — the newly renamed “Sunday Baroque” was launched as a national program on four pilot stations in addition to WSHU: WGUC Cincinnati, KBAQ Phoenix, WETA Washington, DC, and WUSF Tampa. Today, more than 170 stations across the United States broadcast the program to hundreds of thousands of listeners, and Sunday Baroque is still growing as we continue to welcome new stations and new music lovers. Reflecting on these 30 amazing years, it’s clear that listeners like you are the core of our success and growth by every measure. Your calls, letters, emails, and Facebook interactions have provided encouragement, feedback, motivation, guidance and inspiration. You have touched my heart with your countless stories of how the music on Sunday Baroque has entertained, comforted, inspired, amused, and illuminated you in some way. You played the music for your family, and now your kids tell me they grew up listening to the program! And your financial support of Sunday Baroque on your local public radio station has literally made it all possible. Thirty years ago this week I could never have imagined the path that has unfolded. So while this is technically my sentimental journey, I am profoundly aware that YOU are my treasured traveling companion. Thank you for taking Sunday Baroque along with you! “What a Long strange trip…” Thanks for sharing the story and thanks for 30 wonderful years. Thanks! I know you heard the show back in those early years! What a great promo, Suzanne! The folks at Public Radio could learn a thing or two from you! And congrats on all those wunnerful years. I became a sustaining member of WSHU in large part because I so much enjoy your program. Thank you Suzanne for 30 great years of Sunday Baroque. We have been fans since the beginning! Many congratulations Suzanne! It scarcely seems possible that you could have done anything for thirty years, and done it so well. I hope I can get to the celebration in October. Thanks, David! Great to hear from you! One Sunday morning in the spring of 2002, I was in the 3-room upstairs garage apartment home of a poet (big crush) who said, “It’s Sunday, and that means Baroque.” She turned on WUSF and with a perfect breeze blowing through the open windows, I listened for the first time and I’ve been listening since. And you are so right about the familiar melodic path the music takes. Thanks for the wonderful music!